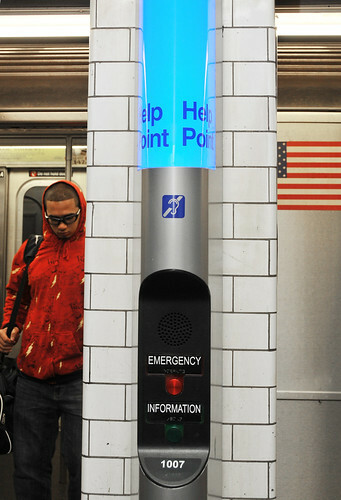 Help Point intercoms are set to arrive at 102 subway stations throughout the city. Photo by Felix Candelaria for the Metropolitan Transportation Authority. For the better part of a decade, the MTA has been throwing a slogan at its riders. “If you see something, say something,” screams print ads, TV commercials, in-system announcements, placards, posters and everything else in between. The trademarked phrase has been leased out to transit agencies around the world and has become a hallmark of subway systems everywhere. The only problem is that you can’t anything when you see something because there’s no one around to listen. Last Monday, as I was journeying back from the Upper West Side to Brooklyn, I got on board the IRT at the southern end of the 96th St. entrance. As the stop between 93rd and 94th on Broadway is just a few blocks from my parents’ place, I’ve been using that station my entire life. Lately, though, it’s changed as the booth is no longer staffed 24 hours a day. The lone station attendant sits outside of the fare control area in the new headhouse at 96th St. When I reached the turnstiles, a pair of guys were hanging out around the entrances. These guys were swipe sellers. They had jammed the turnstiles with folded-up Metrocards, and I guess were trying to sell unsuspecting riders a swipe. They weren’t particularly good at their scheme as they failed to engage two people struggling to make heads or tails of the Metrocard Vending Machines and didn’t react when I pulled out one of cards to swipe through. Still, I figured I would tell someone if I could find anyone. As I waited for the train to show up, I walked the entire length of the platform and hopped up the stairs at the north end of the station. I couldn’t catch the booth attendant’s eye and found no other MTA employee or NYPD officer around. I saw something; I wanted to say something; and I couldn’t. The MTA’s own staffing decisions and budget cuts had, for better or worse, rendered their slogan incompatible with the reality of the situation. Eventually, my train arrived, and I left to head back home. It seems I’m not the only one wondering if the MTA’s ubiquitous ad campaign has reached its end. In this week’s New York Magazine, Dwyer Gunn argues against the anti-terrorism slogan. Noting that the campaign hasn’t really netted anyone terrorists and that New Yorkers are immune to weird goings-on underground, Gunn believes that the signs themselves posted in token booths block station agents’ views of their realm. While some minor criminals have been caught, tips to the MTA’s own hotline are relatively sparse, and the constant announcements concerning rider awareness are lost in the noise shuffle. Gunn’s critique though is missing what I’ve mentioned as the biggest problem: There’s no one to tell. Unless one sees a ticking bomb, how many people are going to try to find that one employee somewhere? What if that one employee is across the street with no free transfer available as is the case at, say, Bergen St. along the IND Culver Line? Train arrives, person leaves, threat of whatever level goes unreported. Perhaps, though, the MTA is onto something. After a successful pilot, Transit announced on Friday afternoon that the Help Point intercoms will be rolled out to 102 stations as part of the current five-year capital plan. The MTA had initially announced a system-wide rollout earlier this March. With two buttons — one for emergencies and one for contact with the station booth — the blue-light intercoms resemble those found on college campuses across the country. Eventually, these intercoms will be everywhere, but for now, it’s a start. At the least, those of us looking to report something — a suspicious bag, shady characters attempting to scam or intimidate other rides, a crime in progress — won’t be left empty-handed. As long as the person on the other end of the line is willing to act and move quickly, saying something after seeing something might not seem as futile as it does today. Fort Collins, Colorado is starting to put anti-terrorism advertisements in the buses. Transfort, the bus agency, scored a Homeland Security grant a while ago for who knows why. It is rather silly that the federal government seriously thinks that of all the infrastructure in the United States, the terrorists will choose a small bus system in a city that most here probably haven’t even heard of. “Anti-terrorism” is pork for would-be fascists. Sort of crazy. What you do in that case is hit the intercomm at the platform level and contact transit bureau officers that way, orreturn to the street and call 911 on your cellphone. By having these guys arrested, you are not just preventing vandalism to the system – you are removing a threat to straphangers’ safety. Swiping rides is probably not the only thing these guys are doing. When NYPD detains them and runs them through the police computer, chances are pretty good they will have other open warrants. I have had several such individuals arrested because whatever else they are doing besides selling swipes isn’t good for my health. Good argument for cellphone service in stations. well yeah that’s the exact strategy taken in the early 90’s that helped to bring down crime. Fare jumpers (then again most high school students did it at one time or another when I was in school)… started to be arrested… and often times they had weapons or drugs on them…. or outstanding warrants. Now I can say something when I see a NY Litter Pig! Why oh why would the MTA waste money installing Help Point Kiosks on its multitude of platforms at this stage of the game of technology. Everyone already has a cellphone today, and by the time that this program would be complete that number will be even higher. Just intall cell service on the platforms. It’s probably cheaper to do and you can probably get a carrier to subsidize it. Don’t worry about in the tunnels. That can come later if we want it at all (and many would argue that they don’t, because subways are one of the few remaining chatter-free zones). Post signs that say what number to call in an emergency. Done. With a dual-purpose solution. The kiosks seem so, well, 1990s. It’s probably a decent stopgap from a legal standpoint, until all three different types of cellular networks have full underground access. Your Verizon or Sprint phones aren’t going to work in the subway if the only cell network available is AT&T, so if the help stations aren’t installed and the MTA only allows an AT&T cellular/wireless network to be put in place (as is the case at select stations right now) you’re telling Verizon and Sprint customers you’re on your own if you see something and want to say something. Do that and the lawyers will be on the case the first time an incident occurs involving a non-AT&T customer. I would agree the MTA should probably skip the shallower stations for now and target the deeper stations first with the new Help Point service. Stations one level underground with vents and sidewalk gratings usually allow for cell phone network signals to get down to the platforms (and if it’s only in certain ares of the stations near the vents, the MTA might even consider some sort of signage pointing riders to the spots where their phones will work). Erik – they are already installing mobile service in all underground stations. Still – that’s not the point… many old ppl don’t have phones… nor do many children. Many tourists might not want to pay roaming charges on their phones. So should they all should be stranded??? Plus – am not sure if a direct line intercom is more efficient or cost effective than a dedicated phone line (311 already exists). I don’t have a cellphone — no way am I paying the overpriced charges for those hunks of junk. That NYMag writer must have had to fill some waste of space deadline. The reality is that NYC was always a “see no evil – hear no evil” town prior to 9/11. The same ridiculous argument is why crime proliferates in certain areas. It’s better to be wrong 1000 times than the 1 time it’s right and the person says “ah – it’s probably nothing”. I don’t get his angle. I’m pretty sure the campaign doesn’t cost much. Bergen Street on the IND Culver line doesn’t have a crossunder? How could that be? it’s an express stop. Granted, the lower level hasn’t been used in decades (and it’s in no condition to be used again soon, despite what Bloomberg promises) but how could there be no transfer? Did it get shuttered with the express platforms? The express platforms are directly under the local platforms. No room for a crossunder. Lies. The transit police almost never are around to prevent anything. On the bright side, when the Help Points are installed it will be easier to prevent something like the Tokyo Metro sarin attacks in 1995. What incompatibility? Find an intercom and use it. Or go to a payphone and call 911. Or wait for a train and tell the conductor. The last thing I want to do if I see something, is to say something. Let’s say there is a suspicious bag left on the station platform. In all likelihood, this bag is just somebody’s lunch or dirty laundry, like every other stray bag found the metro region over the last decade. But once someone reports it, whatever subway line, station, and surrounding area will inevitably be hit with delays while the police investigate. Ian – that’s exactly the mentality that allows bad things to happen. All it takes is one time… whether crime or terrorism. There have been plots foiled and thankfully nothing has happened. Everytime a cop lets a driver go “ah everyone does it”… could mean that driver causes a fatal accident… and on and on. Life is more important than convenience. If the police investigations were not ham-handed operations which obstructed and delayed people, then people would indeed call them in. When you get more trouble from calling the police than from not calling them, Ian’s attitude becomes the only sensible one. Conclusion: if you want to change Ian’s attitude, you have to reform the police. One thing I’ll say for the British police I’ve seen (at Heathrow) is that they move FAST; they understand that part of their job is to *not obstruct everyday operations*.